Schistosomiasis is an infectious disease that affects over 240 million people living in low- and middle-income countries, and is caused by parasitic worms that require snail hosts to complete its lifecycle. To improve public health control of this disease, there is growing interest in using chemical-based snail control that kills snail populations in environmental water sources, which will reduce infection rate in people. 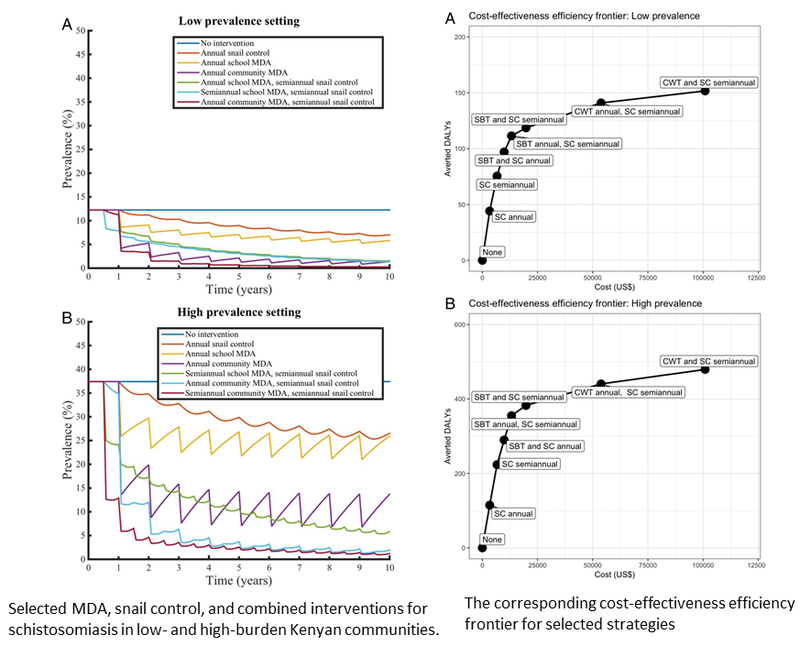 We modeled transmission of schistosomiasis and cost-effectiveness of various strategies with data from low- and high-prevalence rural Kenyan communities. Adding snail control alongside conventional mass treatment programs (instead of mass treatment programs alone) was found to be cost-effective, especially in settings with high disease burden and nonparticipation in mass treatment programs.